Penguin Jump Pencil Roughs by TET. Hand drawn 2D animation, more commonly described as 'traditional' animation, where each character movement is meticulously drawn frame by frame is still one of the most versatile forms of the art. Essentially, if you can draw it, then it can be animated. There's really no limits other than your own drawing and animation skills. If you already have a digital drawing tablet or pen display monitor and want to get into hand drawn, 2D digital animation then these three applications are a great starting point and they're all completely free. and very easy to learn. Pencil2D has been around for many years. In fact I first wrote about it here in 2009. It's an application that was a great idea but wasn't fully developed and could be buggy. After many years with no updates a new team appears to have taken on the task of developing the software further with a few upgrades. I took some time to try the new version out and, whilst it has actually had some features removed (.swf export), or in the process of being reimplemented (vector drawing was way more functional than it currently is), the basic function of creating hand drawn (bitmap/raster) animation all works fine. Pencil2D supports layers and has sound layers which is useful if you're trying to animate speech or just want to add a few basic sound effects. 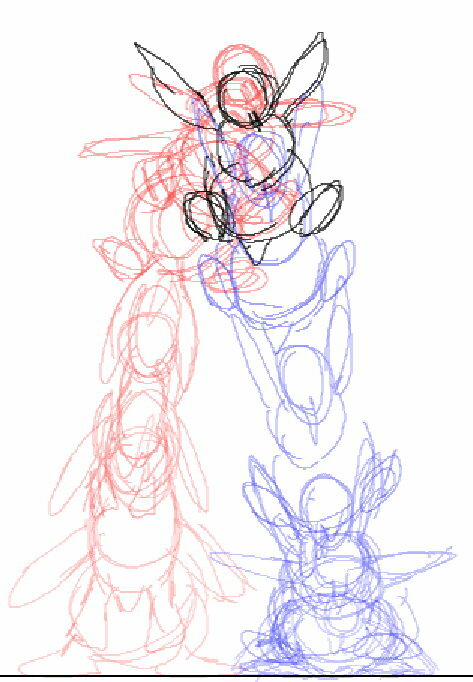 Currently the vector layers and tools are barely functional so I wouldn't use this software to create finished vector line art but I've always enjoyed using it for drawing pencil roughs. From there you can export your frames for importing into another application that supports vectors if you want crisp outlines that don't pixelate. If all you want to do is try your hand at traditional animation without any kind of steep application learning curve getting in your way Pencil 2D is a great starting point. TupiTube markets itself as a tool for children of all ages and by doing so does itself a disservice. Whilst the phone/tablet version of the software (available for Android and soon to be on iOS) is very kid friendly the Desktop version is very much more like a semi professional application. In fact the user interface is setup very much like a professional animators workspace complete with vertically aligned exposure sheet. Although you can import rastor/bitmap images into TupiTube all of its drawing tools are vector based, which isn't ideal for drawing pencil roughs. However, because the vector drawing is quite good I would team this application with Pencil2D and import your finished pencil roughs from that software into TupiTube for tracing into vector lines/finished art. TupiTube has a number of other advanced features including tweening and the ability to integrate with Papagayo (the free lip syncing app). Like Pencil2D the software is still a work in progress with new features on the way - including raster based drawing tools. There are some very impressive animations within TupiTube's tutorials, not all of which are strictly hand drawn animations. The documentation for TupTube is not the best, making it a little difficult to get to grips with quickly. If pencil roughs is more your interest, TupiTube isn't there yet. If you want to take pencil roughs to a more finished level then TupiTube could be just the thing. may be the best app in the long run. Krita is primarily a free professional drawing and illustration application, well worth adding to your tools for that reason alone. In the last year or so animation features have been added making it, useful as a tool specifically for creating hand drawn animation. Based on the current documentation at the time of writing this post, I thought Krita's animation features were going to be quite limited. 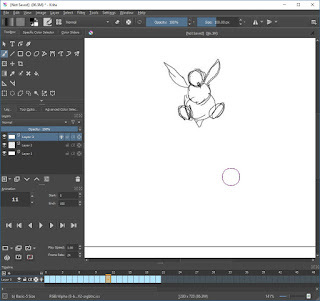 However, after trying them out for myself, it's very clear that Krita's documentation is far behind where the animation features are currently at. For example the documentation says you can only export your animations as a series of PNG frames, which you need other software to reconstruct into a video file. When I actually used the 'Render Animation' option (which doesn't exist in the documentation) there are several options including exporting your animation as an MP4, .gif, and as sequential images. 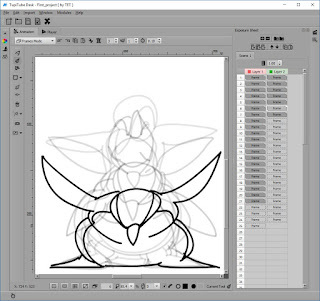 Although Krita has very good support for vector drawing it currently only supports raster/bitmap animation layers. Hopefully support will be added for this in the future. Krita's user interface in contrast to Pencil 2D and TupiTube is initially quite daunting. If you're used to applications like Photoshop you may be able to find your way around Krita without too much looking through the user manual, but if you're coming from Pencil 2D to this, the learning curve is much steeper. Either way, you'll definitely need to step through the online documentation to get a handle on how the animation features work. 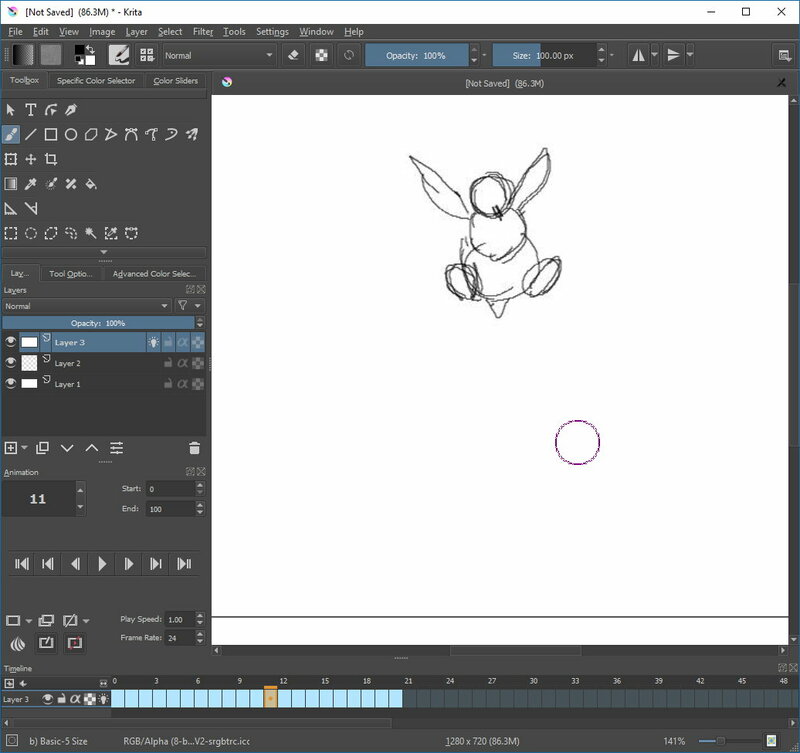 I do feel if you really take the time to learn Krita completely it could well be the only tool you'll need for hand drawn digital animation. All three of the above free applications are available for Windows, iOS (TupiTube soon to be available), and Linux. If you've noticed my little penguin jump sequence in the images with this article so far below, is the pencil rough animation as a GIF image. The initial drawings were done in Pencil 2D which I exported as an image sequence. I then imported these into both TupiTube and Krita. 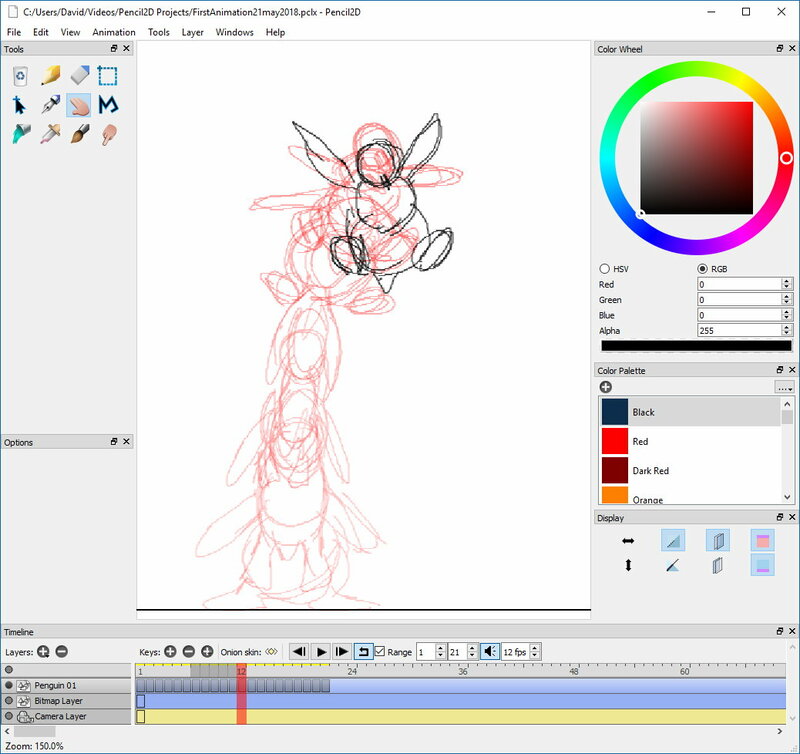 I used Krita to export the sequence as a GIF animation. 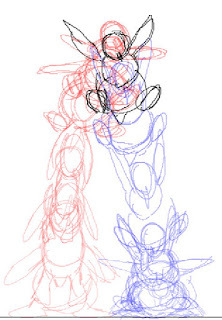 Penguin Jump Pencil Rough by TET. 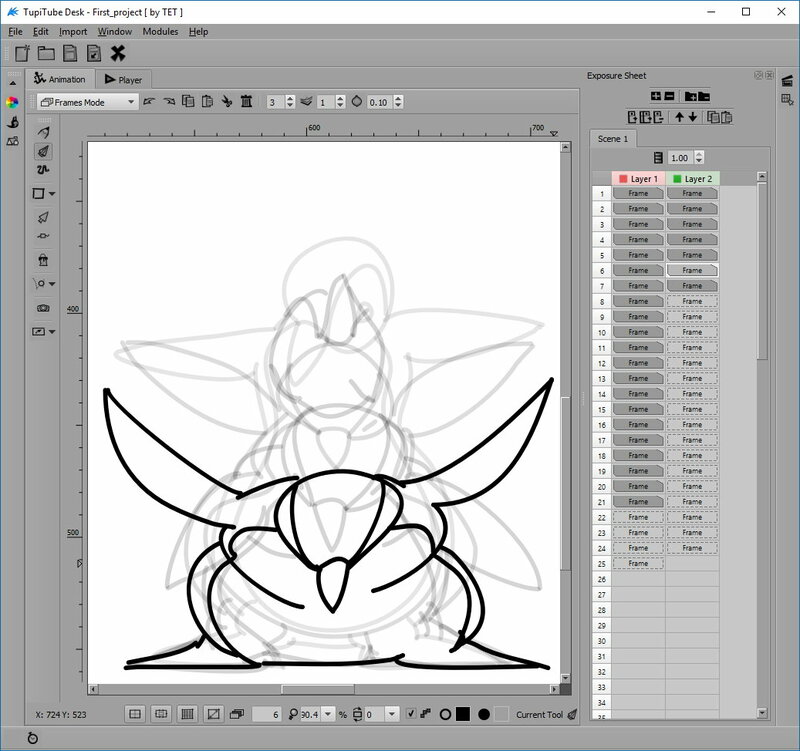 I did start to use TupiTube to create a vector animated version of the sequence but I wasn't entirely happy with the freehand pen tool's ability to draw my lines accurately, and I didn't have time to use the line and node edit tools to refine my work. (If you do have the time I'm certain TupiTube could produce great results). With all these applications being free you may as well try them all. Personally I preferred Pencil 2D for creating Pencil roughs. Krita is a close second. It's user interface is fully customizable so I'm sure with a bit of decluttering you could streamline it so the essential tools are better organized. TupiTube may be something worth trying out if you like the benefits of using vector lines for your finished art. It will also introduce you to concepts of auto tweening that is really only possible with vector based art (which may be a kind of stepping stone to puppet rig character animation).